January is the time of year to pack up from the holidays and get organized for the New Year. Remember, the one thing you shouldn’t ‘pack-up’ is your customer service. It should remain front and center on your shelves, always. January is an ideal time to refresh your customer service and ensure your team members are offering top notch service during the holiday return process and beyond. Stats don’t lie: the American Customer Satisfaction Index (ACSI) reported that the national level of customer satisfaction fell .7 percent in the third quarter of 2014 to 75.6. This decrease reflects the third consecutive quarterly decline in customer satisfaction and the lowest level since early 2011. We need to get back to the basics. Good customer service yields a positive customer experience which results in sales. Customer service that is commensurate with the brand promise is extremely important to repeat sales. Associates need to be trained to think like the customer, and brands need to provide their associates with the tools to empower them to satisfy the customer. Take a look at the retailer Kohl’s returns policy. The retailers’ “no questions asked, hassle-free return policy for all purchases, no receipt required” is part of their customer service policy. Additionally, the retailer honors expired Kohl’s cash – Kohl’s cash are dollars earned from previous purchases for customers to use towards future purchase. The bottom line – Kohl’s understands the needs of their customers and strives to make the shopping experience pleasant, convenient and one that leaves them yearning to come back to shop at a later date. Your employees are at the front line of your customer service and influence the loyalty of your customer base. Communicate with them on a regular basis and provide them with the training and tools they need to offer your customers the service they deserve. And in the New Year, think about new customer service features you can incorporate into your brand. Get inspired and think outside of the box. For example, check out Pizza Hut’s Oven Delivery. 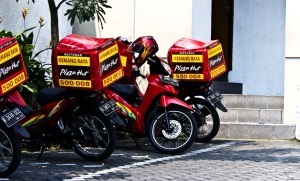 The international restaurant chain installed electric ovens on the back of motorcycles to increase the quality of their product – the pizza – and reduce delivery time. Now that’s superb customer service! Don’t ‘pack-up’ your customer service this month, instead use the New Year to get inspired and focus on how customer service can help drive customer loyalty.